Everyone understands that our (and the world’s) economy is underperforming. While U.S. unemployment is down, people are finding jobs that underpay and/or don’t provide enough hours. Regular people just don’t have enough to get by – never mind enough to drive consumer economies. The lack of pay causes a drop in consumer demand, which leads to economic malaise. So how do you increase demand in an economy? With jobs that pay well. How do you get jobs to pay well? Of course, raise the minimum wage, but another way is to make sure there are plenty of jobs. When there are so many open jobs in an economy that employers start having trouble finding people to work for them, they start to offer better pay. How do you make sure there are enough jobs in an economy? The way that has again and again proven to work is through the government hiring people to do work that needs to be done. The world faces a deficiency of aggregate demand, brought on by a combination of growing inequality and a mindless wave of fiscal austerity. Those at the top spend far less than those at the bottom, so that as money moves up, demand goes down. And countries like Germany that consistently maintain external surpluses are contributing significantly to the key problem of insufficient global demand. At the same time, the U.S. suffers from a milder form of the fiscal austerity prevailing in Europe. Indeed, some 500,000 fewer people are employed by the public sector in the U.S. than before the crisis. With normal expansion in government employment since 2008, there would have been two million more. … There are huge unmet global needs that could spur growth. Infrastructure alone could absorb trillions of dollars in investment, not only true in the developing world, but also in the U.S., which has underinvested in its core infrastructure for decades. Furthermore, the entire world needs to retrofit itself to face the reality of global warming. Everyone understands that our country’s infrastructure is falling down on the job – literally falling down in too many instances. Roads full of holes. Bridges that are structurally unsound. If you are watching the news lately you are seeing failing and inadequate levees, contributing to terrible flooding. The Americans Society of Civil Engineers’ (ASCE) most recent “Infrastructure Report Card” gives our infrastructure a D+ and says we need to invest $3.6 trillion by 2020 just to bring it up to standard. Never mind the high-speed rail and other modernizations that would help us compete in a 21st-century economy. This is work that has to be done – at a time when our economy needs to find jobs for people to do. The Roundtable report shows that the Reagan tax cuts and resulting cutbacks in investment have had their effect. Federal spending accounted for 38 percent of total public investment before Reagan, it’s less than 25 percent today. Cash-strapped state and local governments struggle to make up the rest. 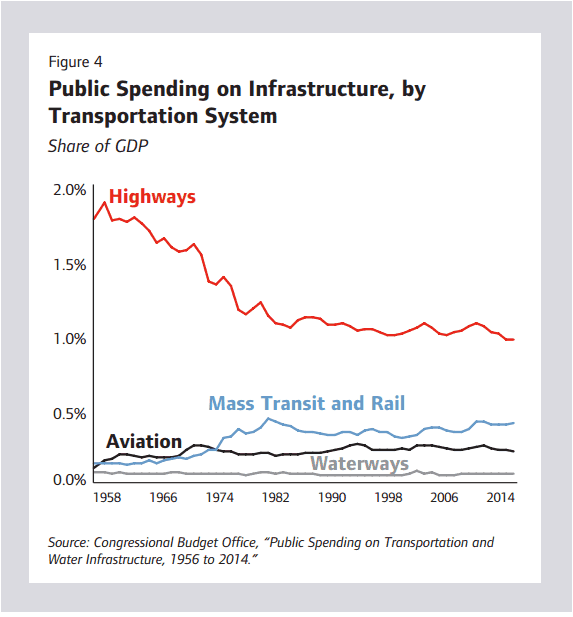 December’s post, “How The Clinton and Sanders Infrastructure Plans Measure Up,” looked at the infrastructure plans from candidates Hillary Clinton and Bernie Sanders. The ASCE “Report Card” says the need is $3.6 trillion by 2020. Only $2 trillion of that has been budgeted, leaving a $1.6 trillion hole. Clinton proposes spending $250 billion dollars over five years with an additional one-time $25 billion to seed a national infrastructure bank. The bank will provide loans to states and cities that will require tolls, fees or special tax levies to pay off. The proposed spending is not broken down by priority. Sanders proposes closing the hole by spending $1 trillion over five years, with the remaining $600 billion to be accounted for by state and local spending. His detailed proposal breaks down the spending into various priority areas. The December post, “The Sanders Corporate Tax Reform Plan,” details how he will raise the money to pay for this. “A few years ago, Moody’s, the financial investment agency, calculated that every $1 of federal money invested in improving the infrastructure for highways and public schools would generate $1.44 back to the economy. The Congressional Budget Office said that infrastructure investments have one of the strongest direct economic impacts. You know why that is? Jobs. These projects put people to work—not just the people doing the work but also the manufacturers, the suppliers, the designers, and, yes, even the lawyers. The Senate Budget Committee estimates that rebuilding America will create 13 million jobs. Ted Cruz’ has not offered specific infrastructure proposals but the Clinton campaign claims that as a senator he has voted to “slash” infrastructure spending. Marco Rubio has also been accused by Clinton of voting to slash infrastructure spending. Rubio’s campaign website proposes to end federal infrastructure spending and have the states pick up the slack. In fact Republican senators repeatedly filibustered bills to spend on infrastructure. Cruz and Rubio both voted against the most recent infrastructure bill, which did pass. Construction remains one of the weakest sectors in the jobs recovery, with unemployment rates in the sector close to 7 percent. Altogether, there are close to 8 million people counted as unemployed, but only about 5.4 million job openings. With a big, bold investment in infrastructure, we can move the economy to full employment, raise wages and put our economy – and our day-to-day lives – on a more firm foundation.